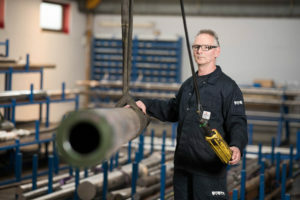 AMW is a Mechanical Workshop in Antwerp specialised in Thermal Spray: The application of wear-resistant Tungsten Carbide coatings via the RAM®procedure, an HVOF process, on all kinds of metal parts. In addition to this HVOF technique, we also use a flame spray process to perform repairs. AMW has an extensive machine park for turning, milling, grinding and polishing work, and we’re your partner for fast machining of all kinds of machine components and spare parts. We work with a number of partner companies and can provide complementary technical and alternative coatings, and additional services, to offer a total solution. We work closely with our customers to optimize the service life of their production process and to reduce downtime. Founded in 1953, AMW has decades of experience in the fields of repairing and manufacturing machine parts. In 1990, the RAM process was introduced, and since then we’ve developed profound expertise in the application of wear resistant coatings on all kinds of parts in a variety of industry and shipping sectors. We have an extensive machine park, conventional and CNC-controlled, for lathing, milling, boring, and both external and internal grinding and polishing. 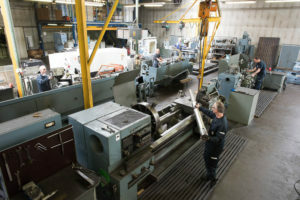 Repairs of existing parts and larger pieces are carried out on conventional machines. New parts are made on CNC machines. For thermal metal spraying, we use a translation system or a robot according to the geometry and position of the substrate. We are proud of our experienced employees, who have between 15 and over 30 years of experience in our company. Their craftsmanship and expertise guarantee the quality of our products and services.